I have a Pioneer MVH-1400NEX head unit with the iDatalink Maestro RR and GM5+ harness kit. My car has a Harmon Kardon 9 speaker stock system with a factory amp, and I’ve added my own subwoofers and amp for them. The HU has three pairs of RCAs for front, rear, and subs (see image 1). The front and rear jacks will be used by the GM5+ harness, and the subs will go to my sub amp. That right there uses all of the RCA jacks, but there’s also a part of the harness that has a center, sub, and backup camera RCA (see image 2). Where do I plug those center and sub plugs into since the jacks on the HU are already being used? Will I have to buy a couple of RCA splitters? I would have thought that everything would have been included with the iDatalink stuff. I know I could use the high level outputs for the front and rear, but since there's a factory amp in play, I'd rather not, and the two sub RCAs would still be used up anyway. Last edited by MetriX on Thu Sep 06, 2018 12:37 am, edited 1 time in total. You don't have to use the RCAs for your speakers, and that would free up the RCA jacks for the center and sub RCAs. Only premium bose vehicles have wires actually populated for the center and sub. Alternately, you can use the speaker wires that come with the harness (to help you identify them, they have heat-shrinked circuit boards on them). The instructions seem to recommend using the RCAs if there’s a factory amp. 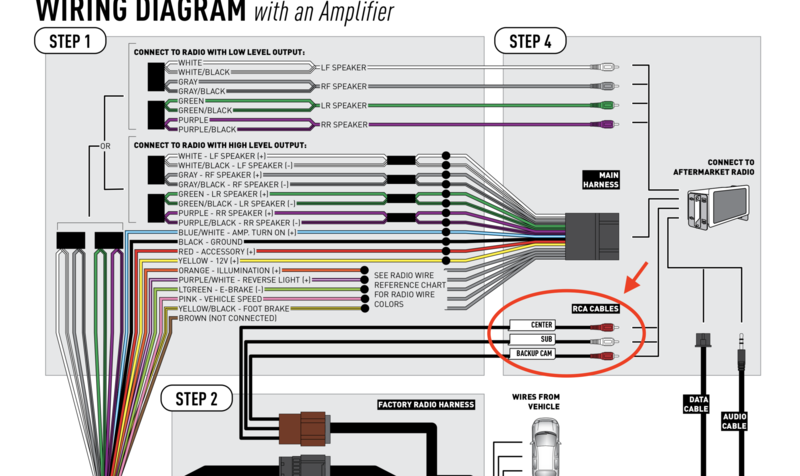 I’d still have to use a splitter for the sub RCA, since my aftermarket sub amp will be plugged into the HU. Would using a splitter for the center RCA be an acceptable solution, or is there some reason why that wouldn’t be a good idea? Using a splitter is fine. Am I correct in understanding that the audio cable going from the Maestro RR box to the aux input on the aftermarket HU is for retaining the factory aux input? Since the aux port in my 2008 Buick Lucerne CXS is located on the factory radio and not in a separate location, do I need to hook up this cable? I wouldn't think so, but I just wanted to make sure it wasn't possibly being used for something else. My plan is to swap the cigarette lighter with a USB/AUX input plug for easy access to those ports on the HU. Also, in the wiring diagram it says to connect the pink VSS wire on the GM5+ harness to the pink wire on the Pioneer harness, but there is no pink wire on the Pioneer harness. Would the HU just get the speed data from the OBD II connection then? I realize that this might be more of a question for Pioneer, but thought that perhaps someone here might know. If the radio doesn't have a VSS wire, that means it doesn't need vehicle speed. The audio cable is NOT for retaining the OEM aux/usb. Those are not retained with this solution, because they run directly up to the radio and plug into it. You would just need adapters to retain those. What’s the audio cable used for then? Will I just need to use an aux splitter on the HU if I want to be able to plug something into the aux input? It's used for retaining your OEM satellite radio, and for playing onstar and turn signal clicks in some circumstances. Use a different input for your aux (the AV input will function just like an aux). Ok, so the aux input on the back of the HU is the only suitable place for the Maestro audio cable? I couldn’t plug it into the AV input instead and use the regular aux in for it’s intended use? I’ve read that when using the AV input as an aux input that the HU will display a “Don’t watch videos while driving” message, even if there’s no video input connected. I’d imagine that would get irritating after awhile, but CarPlay will be used most of the time so I guess it’s not a huge deal. You MUST plug our audio cable into aux or the functions we provide will not work. Hopefully this is my last post here, just want to check something. Got it all installed, and everything seems to be working except that there are no turn signal sounds when listening to Car Sources > Sirius XM. The signal and warning chimes work the rest of the time. Is this just a normal quirk, or did I wire something incorrectly? This is normal operation. We don't have the ability to simultaneously generate both the satellite audio AND the chimes, and mix them. Because of this, we just omit the turn signal click when you're in the OEM Satellite source.